On November 5, the first 6-day China International Import Expo (CIIE) opened at National Exhibition and Convention Center (Shanghai). German KUKA under Midea Group presented a highly complex interconnected model factory at an exposition in China for the first time, and the “Xiaozhi” from Guangdong Tiantai Robot Co Ltd provide peripheral services for the CIIE. In addition to the direct exhibitors, there were also many Shunde intelligent manufacturing products appearing at the Expo. Some Shunde enterprises united with foreign partners such as Foshan U-feel Furniture Industrial Co Ltd. The water-proof project from National Exhibition and Convention Center (Shanghai) used the material from Keshun Waterproof Technology Co Ltd. In addition, the purchasing group composed by more than 100 Shunde enterprises also arrived at the Expo on November 7. With this high-profile global platform, Shunde will continue to introduce global high-end innovative resources to speed up the transition to a high-quality development track. In the exhibition area of smart and high-end equipment, KUKA showed how the electromechanical integration and digital world can merge to make a new production concept possible. Visitors can experience the software solution interaction of collaborative robots, mobile and classic industrial robots, AGV and Ruishige warehouse management system SynQ in the production. KUKA Connect software integrates all electromechanical components and digital platforms of various specific applications, and people can have access to all equipment information and and production status at any time by KUKA Connect. KUKA Smart Factory showcased the robot model at the Expo and prepared a special design: This year marked the 120th birthday of the traditional company in the field of automation. Visitors will be given a chance to obtain a robot model with a personal custom carving. "China is one of the most important markets in the future, and our goal is to be No.1 in Chinese robotics industry", said Dr. Till Reuter, global chief executive of KUKA. As an international technology group, the two-wheel drive system based on "independent expansion and global M & A" allows Midea Group to embrace to global advantage resources. Fang Hongbo, chairman of Midea said that thanks to technological innovation and humanized design, Midea is one of the fastest-growing home appliance technology enterprises in the world. In January 2017, Midea acquired 94.55% stake from KUKA. At present, KUKA robot Shunde Production Base is under construction. 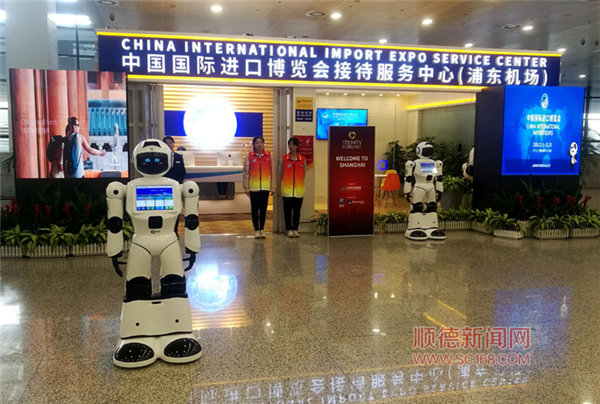 On November 5, the robot “Xiaozhi” independently developed by Guangdong Tiantai Robot Co ltd was providing welcoming service at Shanghai Pudong International Airport arrival hall reception center. In addition to routine inspection, when passengers are found to be approaching, "Xiao Zhi" will also greet with them; when there are visitors around, "Xiao Zhi" will even perform hip hop to the audience. Tiantai Robot also acquired a special exhibition area at the China Pavilion "Innovation and Development Unit" to showcase the company's efforts to build a robotics industry based in Shunde during the Expo. "Xiao Zhi can recognize the voice and face of the speaker, and it can speak both Chinese and English, providing a variety of services such as flight advice, self check-in guidance, interactive entertainment and so on." Zhang Xinghua, general manager of Tiantai Robot introduced. "Xiao Zhi" is mainly used in public places such as airport, high-speed railway station, bank lobby, service center and so on. It has many original patents. It adopts "DBR" core technology to realize 13 technical functions including multi-voice interaction, face recognition, automatic recharging, intelligent obstacle avoidance, stereo environment navigation and etc.